Desmoplastic melanoma is a rare subtype of melanoma accounting for 1–4% of all melanomas. There are a number of clinical and pathological features that distinguish desmoplastic melanoma from conventional melanoma. Desmoplastic melanoma usually occurs in the elderly, particularly males, and on chronically sun-damaged skin, especially on the head and neck region. Lesions often present in an innocuous fashion, and are frequently unrecognized or misdiagnosed clinically. The pathological diagnosis of desmoplastic melanoma can also be very challenging, because the tumor is often very subtle and its morphological features overlap with nonneoplastic conditions such as scars, as well as benign and malignant neoplasms. 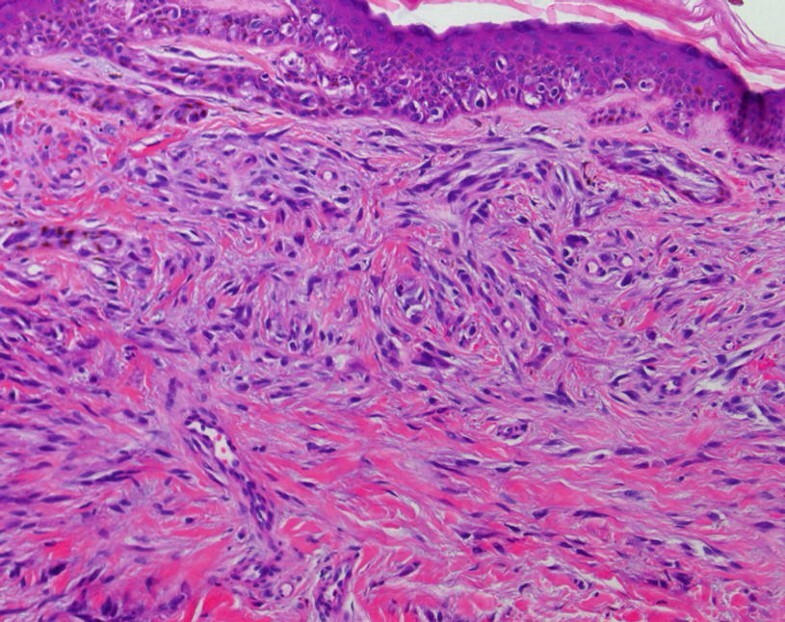 Histologically, desmoplastic melanoma is characterized by malignant spindle cells in which individual tumor cells are separated by collagen fibers. There are two subtypes of desmoplastic melanoma, namely pure and mixed. In the pure subtype, the overwhelming majority of invasive tumor is desmoplastic, while in the mixed subtype (which may consist of spindled or epithelioid cells, or both), the desmoplastic areas account for less than 90% of the invasive tumor. Desmoplastic melanoma has an affinity for nerves and a propensity for local recurrence. Compared with other melanoma subtypes, desmoplastic melanoma more frequently metastasizes to the lungs and less frequently to lymph nodes. The molecular landscape of desmoplastic melanoma is quite different from that of conventional melanoma; it has a higher mutation rate and almost always lacks BRAF, NRAS, or KIT mutations, commonly present in other subtypes. Recent genomic studies have highlighted the very high DNA mutation load of desmoplastic melanoma and clinical studies suggest patients with metastatic desmoplastic melanoma have higher response rates to immunotherapy. Primary desmoplastic melanoma should be treated by wide local excision of the primary tumor. The role of sentinel lymph node biopsy in patients with desmoplastic melanoma is controversial; a number of early studies showed the rate of sentinel lymph node metastasis in patients with pure subtype desmoplastic melanoma was very low (approximately 1%), while much higher rates have been reported in more recent studies. Desmoplastic melanoma was first described by Conley and colleagues in 1971. They reported a small series of patients with particular clinical and pathological features who had poor clinical outcomes compared to other melanoma patients. These patients were older males with chronically sun-damaged skin who presented with amelanotic lesions, which were characterized microscopically by malignant spindle cells in a collagen-rich stroma. Clear surgical margins were difficult to achieve, they had more frequent nerve involvement, and local recurrence was more common (McCarthy et al. 2004). The origin of the desmoplastic stroma in desmoplastic melanoma has been the subject of much controversy. While some authors have suggested that the tumor cells elicit neighboring fibroblasts to proliferate and lay down abundant collagen, others argue that the tumor cells themselves possess an intrinsic ability to produce collagen. While the latter hypothesis was previously supported by ultrastructural examination findings, more recent studies from melanoma cell lines reveal that fibroblasts are responsible for the production of the collagen rather than melanoma cells, thus favoring the former hypothesis (McCarthy et al. 2004). Desmoplastic melanoma arises most commonly in elderly patients (mean age at diagnosis = 65 years). This is approximately 10 years older than for conventional melanoma. It has a predilection for Caucasian males (M: F = 2: 1). Chronic sun exposure is a strong predisposing risk factor and in order of decreasing frequency, the commonest anatomic sites affected are the head and neck region (~50%), extremities (~30%), and trunk (~20%). However, desmoplastic melanoma can involve any site (Chen et al. 2013). 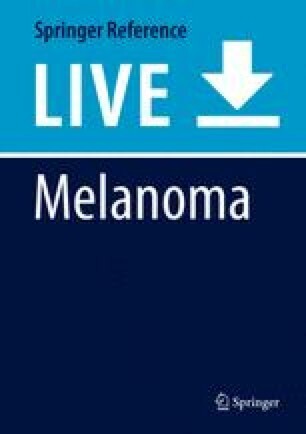 Unlike conventional melanoma, desmoplastic melanoma often lacks the clinical ABCDE warning signs (asymmetry, border irregularity, color variation, diameter enlargement, and evolution/history of change) of melanoma (Oakley 2017). Patients usually present with a slow-growing painless indurated plaque or nodule, which is amelanotic in more than one half of cases. Some lesions may begin as a small papule. Pigmentation, when present, is usually due to an accompanying melanoma in situ component (often a lentigo maligna), which coexists in up to 50% of cases. Palpation of a lentigo maligna lesion may disclose an underlying thickening or nodularity, which may be a clue to an unsuspected desmoplastic melanoma (Chen et al. 2013). Desmoplastic melanoma may be mistaken on pathological examination for other disease processes such as a scar, nodular fasciitis, dermatofibroma, or neurofibroma. Under-recognition and low clinical suspicion can result in delayed diagnosis and management. Tumors can be thick before they come to clinical attention; lesions have a median Breslow thickness of 2.5 mm at the time of diagnosis (McCarthy et al. 2004). Dermoscopy reveals pigmented globules in about one half of cases. There may be features of regression including scar-like areas and gray dots and an atypical or polymorphous vascular pattern can be present (Oakley 2017). The typical clinical course of desmoplastic melanoma differs from that of conventional melanoma in a number of ways. There is a greater propensity for nerve involvement, achieving clear surgical margins can be difficult, and the risk of local recurrence is higher. On the other hand, the incidence of regional lymph node metastasis is lower than in conventional melanoma. Distant metastases typically occur in the lung or bone as a result of hematogenous spread (Murali et al. 2011). Desmoplastic melanoma is a variant of spindle cell melanoma initially centered predominantly in the dermis but often extending more deeply into the subcutis and occasionally involving underlying structures. Desmoplasia refers to the growth of fibrous or connective tissue. Desmoplastic melanoma is characterized by relatively paucicellular amelanotic malignant spindle cells associated with abundant collagen fibers that separate individual tumor cells. On hematoxylin- and eosin-stained tissue sections, the predominant stromal component often gives rise to a poorly defined area of pink change at scanning magnification, and is often accompanied by myxoid change. 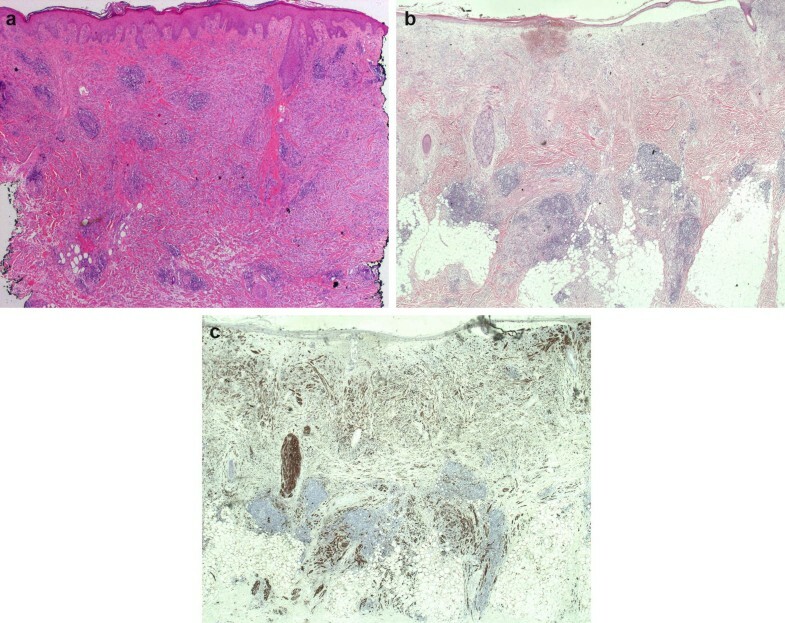 Desmoplastic melanoma tends to infiltrate the dermis and deeper structures in an irregular or tentacular pattern and the microscopic features can be very subtle (McCarthy et al. 2004) (See Figs. 1, 2, 3, and 4). Criteria proposed by Busam et al. from Memorial Sloan Kettering Cancer Center defined two subtypes of desmoplastic melanoma: pure and mixed (or “combined”). In pure desmoplastic melanoma, the overwhelming majority of invasive tumor (i.e., more than 90%) is desmoplastic. If desmoplastic areas account for less than this, then it is considered a mixed desmoplastic melanoma. The latter subtype consists of both desmoplastic and nondesmoplastic components. The latter may be formed by spindled or epithelioid cells, or both (Murali et al. 2011). Compared to the pure subtype, mixed desmoplastic melanoma has an increased risk of sentinel node positivity as well as of local and distant recurrence, but these rates are intermediate between those of pure desmoplastic melanoma and conventional melanoma (Scolyer and Thompson 2005). With a strong association with chronic UV radiation, concomitant melanoma in situ (often a lentigo maligna) in the overlying epidermis is present in up to 50% of cases of desmoplastic melanoma (see Figs. 1 and 2). However, an epidermal component is not essential for the diagnosis. Regardless, the background skin typically shows features of severe sun damage, including epidermal atrophy and moderate to marked solar elastosis. Ulceration is not a common finding (McCarthy et al. 2004). The tumor cells are fusiform, with epithelioid morphology seen only in mixed subtypes. While the degree of cytological atypia is variable, more often than not the tumor cells show only mild nuclear variability with enlargement and hyperchromasia and perhaps only focal pleomorphism (see Fig. 4c). The cells have elongated nuclei, irregular nuclear contours, and an open chromatin pattern with small but distinct nucleoli. The cytoplasm is poorly defined. Melanin pigment is inconspicuous or absent. Mitoses are usually infrequent but occasionally prominent. Given the mild cytological atypia, the tumor cells can be easily overlooked or misinterpreted as fibroblasts or spindle cells of another histogenesis (McCarthy et al. 2004). Immunohistochemical stains for S100 and Sox10 can be helpful in difficult cases but should be used judiciously (see further details below). One of the most helpful clues to pathological diagnosis is the presence of lymphoid aggregates, with or without accompanying plasma cells, at the periphery of the tumor or within it. These lymphoid aggregates are often located in the deep dermis or subcutis (Chen et al. 2013). However, lymphoid aggregates are not ubiquitous in desmoplastic melanoma and may not be captured in small biopsies. Furthermore, they may, on occasion, accompany other benign processes that may enter the differential diagnosis such as scars, sclerosing nevi, or neurofibromas. Neurotropism, seen in about 30% of cases, is more common in desmoplastic melanoma compared with conventional melanoma (where it is present in up to 5%) (McCarthy et al. 2004). Three main patterns of nerve involvement have been described: perineural invasion, intraneural (or endoneural) invasion, and neural transformation, although it is somewhat controversial whether the latter should be regarded as a form of neurotropism (Varey et al. 2017). Perineural and intraneural invasion are terms referring to the extension of tumor cells around and within preexisting nerve structures, respectively (see Fig. 5a, b). In contrast, neural transformation occurs when tumor cells adopt the cytological characteristics of nerve cells, often in the form of nerve twigs. Although neurotropism does not influence survival directly, it is associated with a significantly increased risk of local recurrence because of the difficulty in achieving margin control (Murali et al. 2011). When neurotropism is present, postoperative radiotherapy may reduce the risk of local recurrence, particularly when there is difficulty achieving adequate surgical clearance margins (Chen et al. 2013). Lymphovascular space invasion is rare. Occasionally, angioinvasion may be seen, as this is the presumed route for distant metastatic spread (Murali et al. 2010). Fine needle biopsy (FNB) is frequently used to diagnose metastatic melanoma, including desmoplastic melanoma, but it has only a very limited role in the assessment of primary tumors. FNB specimens from desmoplastic melanoma are often paucicellular due to the significant stromal content. Diagnosis can be even more challenging considering that the tumor cells tend to lack significant cytological atypia and mitotic activity. Compared to conventional melanoma, the tumor cells less frequently contain intranuclear cytoplasmic invaginations or intracytoplasmic melanin pigment (Murali et al. 2008). In the event of an insufficient or nondiagnostic cytology specimen and ongoing clinical suspicion, formal tissue biopsy for histopathological assessment is warranted. Desmoplastic melanoma is typically diffusely positive for S100 protein and Sox10 (see Figs. 2, 3, and 4). S100 stains positively in both the cytoplasm and nuclei of desmoplastic melanoma cells and can be useful in highlighting their dendritic appearance, while Sox10 is restricted to staining nuclei. In contrast to conventional melanoma, other markers of melanocytic differentiation including HMB45, MelanA/MART1, tyrosinase, and MITF are usually negative or only focally positive. These latter markers are more likely to be positive in epithelioid cells of the mixed subtype of desmoplastic melanoma (McCarthy et al. 2004; Murali et al. 2008). A potential pitfall in the interpretation of immunohistochemical stains, especially in post-biopsy specimens, is that fibroblasts in scars are also immunoreactive with S100 and Sox10. Therefore, pathologists should not rely solely upon this ancillary method for diagnosis – careful attention to morphological detail is of paramount importance as the immunostains need to be interpreted in the appropriate context (Murali et al. 2011). Desmoplastic melanoma may also exhibit a nonspecific staining pattern for SMA, CD10, and CD34. 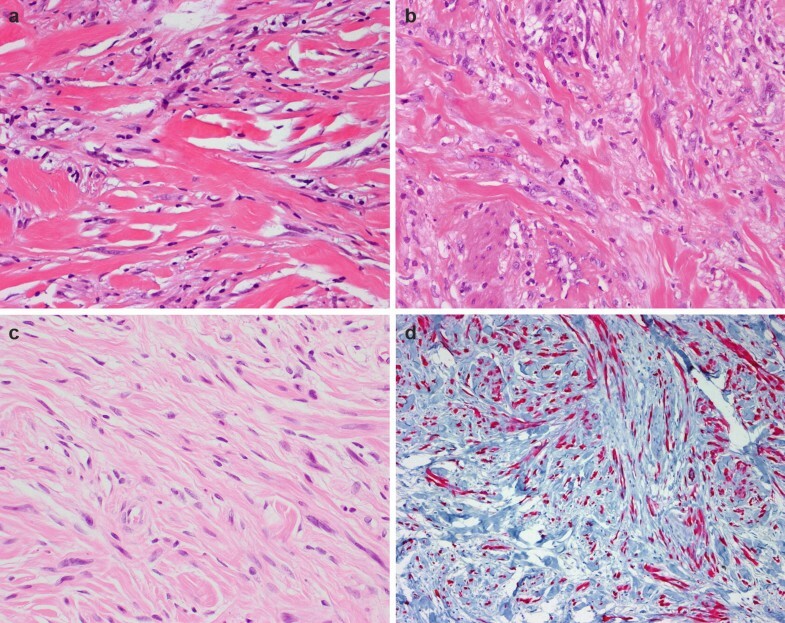 It has been suggested that CD34 can be useful in distinguishing desmoplastic melanoma from neurofibroma, with the latter showing a “fingerprint distribution” (Yeh and McCalmont 2011); however, it is our experience that this pattern is not uncommon in desmoplastic melanoma and has little practical value. Understanding of the genomic landscape of melanoma (including desmoplastic melanoma) has expanded rapidly in recent years with the discovery of significant genetic alterations that underlie the pathogenesis of the disease. Desmoplastic melanoma is among the most highly mutated of all human neoplasms. With more than 60 mutations per megabase of DNA, it has an exceptionally high mutation burden and DNA signatures have strongly implicated ultraviolet radiation as the dominant etiological cause. This lends support to the theory of a superficially located cell of origin and is consistent with the presence of associated melanoma in situ (lentigo maligna) in a significant proportion of cases (Hunter Shain et al. 2015). Recently, recurrent NFKBIE promoter mutations and diverse activating mutations in the MAPK pathway have been identified using exome sequencing. The MAPK pathway mutations are mutually exclusive of those well recognized in conventional melanomas (namely BRAF and NRAS). Instead, other mutations involving activation of the MAPK and PI3K signaling cascades, including CDKN2A and NF1, are relatively common. Mutations of the tumor suppressor gene NF1 are usually nonsense mutations with premature stop codons, leading to lack of NF1 protein expression. TP53 mutations are also found in a large proportion of desmoplastic melanomas, in contrast to conventional melanomas (see Fig. 6) (Hunter Shain et al. 2015). Given the wide spectrum of overlapping and often subtle clinicopathological features that may occur in desmoplastic melanoma, its diagnosis can be challenging. It can mimic a range of conditions including both completely benign entities and malignant processes. A previous history of melanoma should always prompt consideration of recurrence or a new primary melanoma. Diagnosis may be inadvertently delayed if clinical suspicion is lacking and a biopsy is not performed, or if the pathologist fails to recognize the subtle histopathological features of desmoplastic melanoma. As a consequence, desmoplastic melanoma is often not diagnosed until it is at an advanced stage. In the setting of chronically sun-damaged skin, pathologists should always consider the possibility of desmoplastic melanoma and search carefully for any of the aforementioned constellation of histopathological features. Clinical mimics include scar, desmoplastic nevus, dermatofibroma (fibrous histiocytoma), and neurofibroma (McCarthy et al. 2004). Dermal scar is probably the most common diagnostic dilemma. While the dermal tumor cells in desmoplastic melanoma are distributed haphazardly among collagen, the spindle-shaped dermal fibroblasts in scars are typically aligned parallel to the overlying epidermis. A potential hazard in distinguishing scars from desmoplastic melanoma lies in the misinterpretation of immunohistochemical stains as S100 and Sox10 can be expressed in both, albeit usually only focally in the former. Careful evaluation of the architectural and cytological features is required to avoid this mistake (Chen et al. 2008). Desmoplastic nevi typically arise at a younger age than desmoplastic melanoma. Microscopically these lesions usually display symmetry, are confined to the superficial dermis, and few, if any, associated lymphocytes are present. In addition to S100 and Sox10 immunoreactivity, they also express other melanocytic markers such as MelanA/MART1, in contrast to desmoplastic melanoma (McCarthy et al. 2004). Dermatofibromas also occur at a younger age and commonly involve the legs of young female adults. The histopathological findings are those of a circumscribed dermal proliferation of spindle cells with a fibrohistiocytic appearance and dermal collagen entrapment at the periphery of the lesion. Associated diffuse epidermal hyperplasia with increased basal pigmentation is also usually present. While assessment can be challenging on a small biopsy where the entire lesion has not been sampled, positive immunostaining for Factor XIIIa and SMA and absent staining for S100 and Sox10 should clinch the diagnosis of dermatofibroma (McCarthy et al. 2004). Neurofibroma and desmoplastic melanoma can share similar clinical and pathological features. Both usually present as amelanotic papules or nodules and both are characterized microscopically by a spindle cell proliferation with associated collagenous stroma. Unfortunately, immunohistochemistry is not as helpful in distinguishing these two entities, as both are positive for S100 and Sox10 and negative for MelanA/MART1 and HMB45. Therefore, close attention to the morphological findings is required to establish a diagnosis. The growth pattern of neurofibroma is generally more circumscribed (except in the diffuse variant), the lesion is usually symmetrical and the lesional spindle cells tend to have more tapered nuclear contours (Murali et al. 2008). The mainstay of management of biopsy-proven desmoplastic melanoma is wide surgical excision with the same recommended clearance margins as for conventional melanoma, which vary according to the primary tumor thickness. The role of sentinel lymph node biopsy in desmoplastic melanoma has been questioned due to the lower incidence of positivity in both pure (1–5%) and mixed (5–20%) subtypes. Nevertheless, this procedure forms part of routine practice in many melanoma treatment centers. Local recurrence rates are higher in desmoplastic melanoma compared to conventional melanoma. Adjuvant radiotherapy may be offered in certain circumstances, usually when margin control is difficult to achieve or when there is nerve involvement. Systemic therapy options continue to evolve. The exceedingly high mutation burden found in desmoplastic melanoma makes it a promising candidate for immune checkpoint blockade therapy and preliminary data suggest that higher response rates are observed in desmoplastic melanoma compared with conventional melanoma. Like other types of melanoma, surgery is the mainstay of treatment of desmoplastic melanoma. This involves wide local excision aiming to achieve clear peripheral margins of 1 cm for tumor thickness less than or equal to 1 mm, 1–2 cm for tumors 1–2 mm thick, and at least 2 cm for tumors greater than 2 mm thick. It is also important to achieve adequate deep margins, as there is often extension into the subcutis or even deep fascia and underlying tissues. Achieving clear margins is not always possible on the initial excision due to the insidiously infiltrative nature of the tumor (Varey et al. 2017). The role of sentinel lymph node biopsy in patients with desmoplastic melanoma is somewhat controversial. The rate of sentinel lymph node positivity at the time of diagnosis when matched for tumor thickness is lower (1–5% for pure subtype desmoplastic melanoma) than conventional melanoma (about 16%) (Scolyer and Thompson 2005; Dunne et al. 2017). While some advocate the routine practice of sentinel lymph node biopsy, others propose that the frequency of sentinel lymph node metastasis is so low that the procedure can be safely avoided (Gyorki et al. 2003). At Melanoma Institute Australia, we continue to offer sentinel lymph node biopsy to all patients with melanoma tumor thickness > 1 mm. With recent clinical trials reporting reduced rates of recurrence in stage III melanoma patients who received adjuvant targeted and immune therapies, it would appear that the role of sentinel lymph node biopsy in desmoplastic melanoma might expand in centers where this staging procedure is not currently part of the routine management of patients with desmoplastic melanoma. Radiotherapy may be beneficial in some cases of desmoplastic melanoma, particularly when it is difficult to achieve clear surgical margins or when there is nerve involvement. In the event of positive or narrow margins or extensive neurotropism and where functional and/or cosmetic reasons preclude wider re-excision, radiation in a dose of 20–40 gray over six fractions can be applied to reduce the risk of local recurrence. This is particularly relevant for lesions arising in the head and neck region (Chen et al. 2008). The exceedingly high mutation burden found in desmoplastic melanoma makes it a promising candidate for immune checkpoint blockade therapy. Emerging data have shown that patients with desmoplastic melanoma respond well to anti-PD1 agents. Response rates are in the order of about 70%, significantly higher than those for conventional melanoma (40%). The presumed reason for this higher response rate is that desmoplastic melanoma expresses high levels of PD-L1. In their study, Eroglu et al. (2018) found that single agent anti-PD1 therapy, rather than the more toxic combination immunotherapy involving both anti-PD1 and anti-CTLA-4 inhibition, might be sufficient for patients with desmoplastic melanoma. In 1988, Egbert et al. asserted that the clinical outcome for desmoplastic melanoma was far worse than for other types of melanoma, but failed to consider important pathologic prognostic features in their analyses (Scolyer and Thompson 2005). In contrast, recent studies have found that when matched for tumor thickness, survival times were actually longer. Some studies have shown a poorer prognosis for patients with desmoplastic melanoma in cases of male gender, older age, and head and neck location (McCarthy et al. 2004). By definition, recurrence is local when at or near the surgical excision site (<5 cm), in transit when >5 cm from the surgical excision site but not beyond the draining lymph node basin, and regional when it has reached the draining lymph node basin. Local recurrences are common in desmoplastic melanoma compared to conventional melanoma, especially following incomplete or narrow (<10 mm) surgical excision or when there is neurotropism. Most recurrences (78.2%) occur within the first 2 years. Distant metastases occur in 11–40% of patients with desmoplastic melanoma (Chen et al. 2008). Desmoplastic melanoma is a rare subtype of spindle cell melanoma with a strong association with high cumulative UV exposure and a predilection to involve the head and neck region. It affects males almost twice as often as females and occurs with a median age of diagnosis approximately 10 years later than conventional melanoma. Desmoplastic melanoma is a great mimicker both clinically and pathologically and as such, a high index of suspicion, especially in patients with a previous melanoma history, is essential to avoid misdiagnosis. Immunohistochemistry for S100 and Sox10 can be employed as an ancillary test but must be interpreted with caution, as the staining pattern in desmoplastic melanoma is not specific. Desmoplastic melanoma is among the most highly mutated of all human neoplasms. Recurrent mutations in NF1, TP53, and NFKBIE have been documented in desmoplastic melanoma. This contrasts with the prevalent BRAF and NRAS mutations identified in conventional melanoma. The mainstay of treatment is surgical excision with a surrounding wide margin of normal tissue. Desmoplastic melanoma infiltrates deeply, sometimes making adequate excision difficult, and it has a propensity for nerve involvement. There is a high risk of local recurrence if peripheral and deep excision margins are narrow or incomplete. Compared to conventional melanoma, there is a reduced likelihood of sentinel node positivity, especially in the pure subtype. When matched for stage, however, prognosis is comparable between conventional and desmoplastic melanomas. R.A.S. is supported by the National Health and Medical Research Council of Australia. J.F.T. is supported by the Melanoma Foundation of the University of Sydney. T.A.B.. is supported by a Melanoma Institute Australia Fellowship funded by Deborah and John McMurtrie.